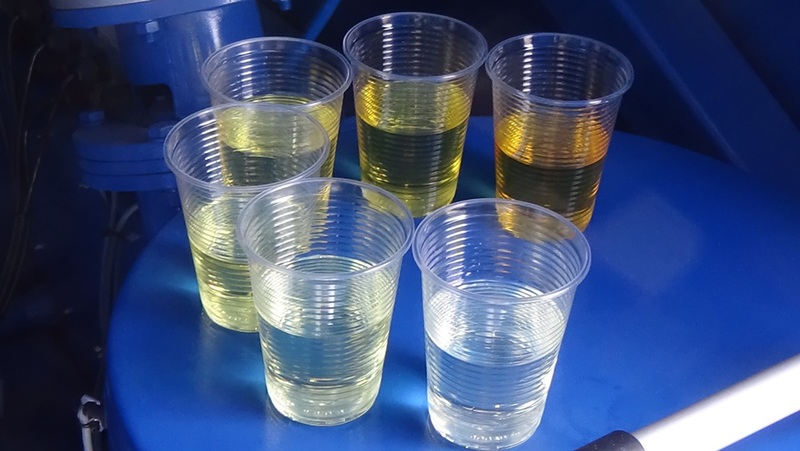 The density of transformer oil belongs to the most important of its physical characteristics, which largely determine the quality of the oil and its performance. Density of transformer oil depends on the manufacturer. But basically, this number can not exceed 900 kg/m3 at 20°C. Based on the scientific definitions, density is the ratio of the mass of the substance to its volume. With increasing temperature, density of oil decreases. In the domestic market, the standard density range varies from 840 to 890 kg/m3, depending on oil’s chemical composition. Along with other indicators, such as specific heat, thermal conductivity, kinematic and dynamic viscosity, thermal diffusivity, etc., the density of transformer oil characterizes his performance and quality. Requirements for transformer oil in accordance with its intended purpose (insulating material, heat dissipation and arc extinguishing medium, and the medium protecting solid insulation against the ingress of moisture and air) are reflected in the technical standards and documents. Moreover, the density of transformer oil is a benchmark for calculating other characteristics. Kinematic viscosity or specific internal friction coefficient is the ratio of the dynamic viscosity at a given temperature and density. The viscosity of any fluid, including oil, is characterized by its ability to offer resistance when moving one portion of the liquid relative to the other. Viscosity is a parameter which affects heat transfer with natural circulation of oil in small transformers, and forced circulation by pumps inside large transformers. This figure describes the function of the transformer oil as a coolant, and, on the other hand, influences its dielectric strength. Therefore, calculation of viscosity always remains an important part of any examination of the fluid, and generally requires the average to match both functions of transformer oil. In practice, it is also very important to calculate the index of oil viscosity at low temperatures to work in the Arctic, the experimental determination of which is quite complex. Thus, the density of transformer oil is among major physical characteristics, because this equation includes other parameters. And just as density depends on the raw material, other characteristics may depend on density, thus simplifying the procedure for examination of transformer oil quality.